The virtual machine cannot be moved to the destination computer. The hardware on the destination computer is not compatible with the hardware requirements of this virtual machine. 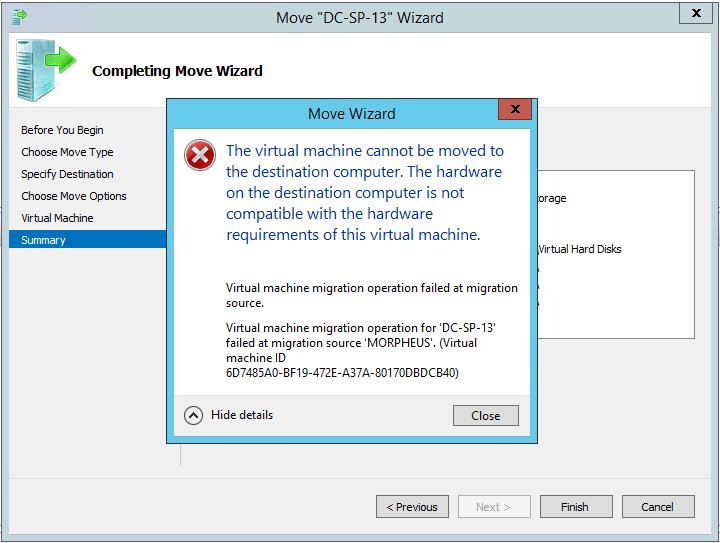 Virtual machine migration operation failed at migration source. Virtual machine migration operation for ‘VM’ failed at migration source ‘HOST’. Since I had just moved this machine earlier in the day between the two hosts, it seemed odd to me that they had incompatible hardware. Both are running similar Intel processors, the 2012 VHDX format hasn’t changed as far as I know, and I was moving from the lower end machine back to the higher end, so it couldn’t have been a constraint for number of vCPUs or RAM. As it turns out, it was something silly. If the name of the vSwitch is different between the source and destination, the move will fail. My new 2012 R2 server’s vSwitch was named the default name Windows assigned to it. The older 2012 server’s vSwitch was just named “Bob.” Just kidding, it was called “Internal Ethernet.” I changed the vSwitch name on the new server to match, and the move completed without issue. Shared-nothing moves are amazing! Literally, the move of this server completed in under three hours over a 1Gbps link from a 4200RPM source drive. I ran a continuous TCPING to port 80, and dropped exactly one packet. When it comes to Hyper-V and rebalancing machines, I like to move it move it.